Getting a disability benefits denial letter is shocking on its own. What makes it even worse is reading in the letter that the insurance company used your doctor’s own words as reason to deny the claim. In the real world, when a doctor says you are disabled, it means that they believe you are disabled and are not able to work. However, despite what your doctor may say, the insurance company will look for reasons to ignore this opinion in favor of one they like better - theirs. The most effective way to invalidate a diagnosis is to turn the doctor’s notes into a weapon against your claim. Insurance companies do have a right to review all the medical evidence related to your disability. This typically includes a summary of your condition and your limitations written by a doctor. You may believe your claim is safe because the summary from your doctor states “the patient is 100% disabled,” but often that is the part insurance companies will ignore. They will argue that your doctor’s opinion is “not well-supported by the available evidence,“ or worse – they will say the restrictions and limitations set by your doctor mean you can work. How can this be? In short, the insurance company will review the doctor’s office notes with a fine-toothed comb, cherry picking the language that supports denial of your claim and nothing else. Were you feeling better one day? Did the doctor advise you to begin a modest exercise program? The insurance company will say, “see…you can work!” This can leave many people, even those with life-altering diagnoses, in a position where their insurance company refuses to pay out the claim. Cherry-picking is bad, but misinterpreting your functional capacity is even worse. The insurance company will be tricky about this. They will give your doctor a long form to fill out, and may even call to talk with them about your functional capacity. They will want to know how long you can sit, stand, walk, etc. The truth is, in many cases, if your doctor says you do not have any restrictions on your ability to sit, the insurance company stops listening right there. It doesn’t matter what else your doctor says. The insurance company will argue that if you can sit for an eight-hour day, you can work a full-time job. Nothing may be further from the truth, of course, but when they objective is to deny a disability claim, hearing “my patient can sit with no restrictions” is often enough to do it. We’ve spoken to people who decided to appeal their long-term disability claim without an attorney, only to find themselves at an impasse with the doctor who previously claimed they were disabled. 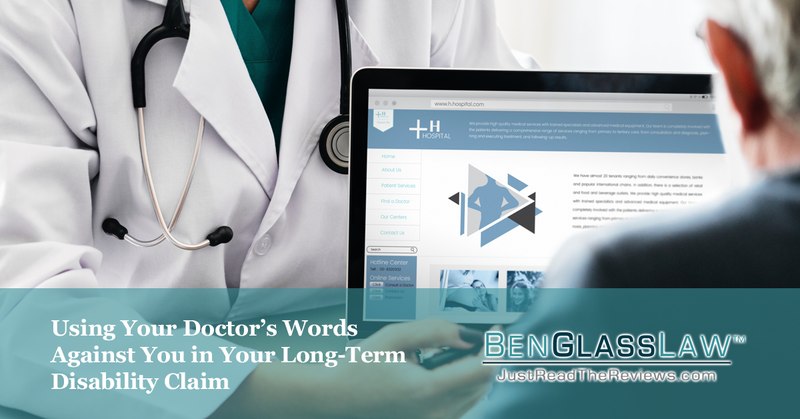 When the insurance company uses the doctor’s own words against them, they are put into a position where they need to refute their own statements. This is difficult for any medical professional. An attorney can review the insurance company’s decision and refute their conclusions, but the same task would be difficult for a doctor. When confronted with the insurance company’s conclusions drawn from the doctor’s own notes, doctors often don’t know how to proceed. Professionally, they can’t “take back” what they said, but they also don’t know how to reframe the situation to support their own patient. In this scenario, you need to hire an attorney to move your claim forward.